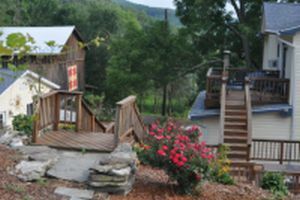 Fred and Valeria live in the Endless Mountains of Pennsylvania, just north of the "Doo Dah" town of Camptown (where Stephen Foster wrote the "Camptown Races" song). They have a 32-acre property that they have extensively remodeled and landscaped. Fred designed and built all of the kitchen cabinets and hardwood floors (the real stuff from trees that he cut down and sawed into boards, etc. ), landscaped the property with nearly 1,000 trees, native grass plantings and gardens. Fred and Val have a sugar bush on the property with in excess of 250 sugar maple trees that they tap and make maple syrup both for their own consumption and for sale. Check with Fred in the spring for maple sales- jump on it early as it sells out quickly! They hunt, fish, make wine, bake fantastic foods and preserve foods that they grow (Fred likes to say "We eat what we can and what we can't we can"), and, in general, live a country life. They also enjoy bicycling on their Santana Scandium Tandem, traveling several hundred miles on the bike each year (and once to New Zealand!). Val's quilting studio, sewing, and fabric dyeing rooms keep her occupied. Val sells Gammill quilting machines, teaches longarm quilting classes, quilts for others and produces exquisite one-of-a-kind quilts for sale (as well as keeping Fred fat and sassy with her exquisite cooking). Fred's large workshop allows him to produce furniture, art objects, items for sale, and repair/replace/produce all of the things that are required to remodel his house. Fred is also active in teaching woodturning and writing educational articles for various woodworking publications, etc. They now produce almost ALL of their power by solar! Actually, at this time they are also exporting power to the grid so you might be using some of the power that they produce. 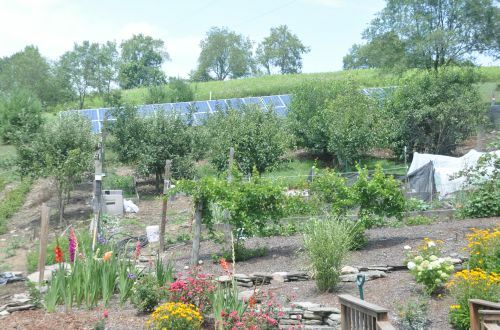 They have 777 square feet of freestanding solar panels that produce over 1.2 megawatts of electricity a month (go to Google Maps and look just to the north of their house and you can see the panels). They are excited about this especially in light of the fact that electric production using fossil fuels (coal, oil, gas) normally releases a huge amount of the greenhouse gas, carbon dioxide. The photo to the right shows the panels to the north of their garden in July. Along with the fact that they heat their home, greenhouse and Fred's studio with an outdoor wood furnace (burning wood doesn't add to the carbon dioxide in the atmosphere since it is normally recycling there). If the trees Fred and Val burned instead simply rotted on the ground, they would have the same carbon dioxide impact as if they were burned) and drive a Prius and bicycles, and have planted hundreds of trees on their property, they have done and will continue to do a great deal to help their environment. Unfortunately, both Fred (four times) and Val (twice) have contracted Lyme disease from deer ticks in the area. Fred wrote an in-depth article about Lyme disease. Click HERE to read the article. The very significant part of the article is the references. Be sure to go online and check each of them. Prior to moving to this property, Fred was a university professor in biology and is presently Professor Emeritus from Bloomsburg University. He holds a Ph.D. in biology from the University of Louisville and a Bachelor's and Master's degrees in biology from Illinois State University. Val was a registered nurse with a BSN from Bloomsburg University and is retired from being a Hospice Nurse. Fred has always had a passion for wood, having remodeled three houses and built furniture, cabinets, etc. for many years. Ask him to show you the wooden sailboat that he made in shop class in 1958 (and, by the way, got an A+ on it)! Now that the challenging work of remodeling the house is nearly over (however, Val still has a "honey-do" list that never seems to get shorter!) he can get to the things he really enjoys, making creative objects in the shop. It is with this in mind that the items presented on this web site are offered for your viewing enjoyment and for sale. We hope you enjoy looking at the photos and, be sure to visit Val's quilting site to see her fantastic creations! Please visit me on Facebook (Fred's Creative Woodworking). Please contact Fred with any comments or suggestions.